For all of these hairstyles I am using Goody’s hairbrushes. 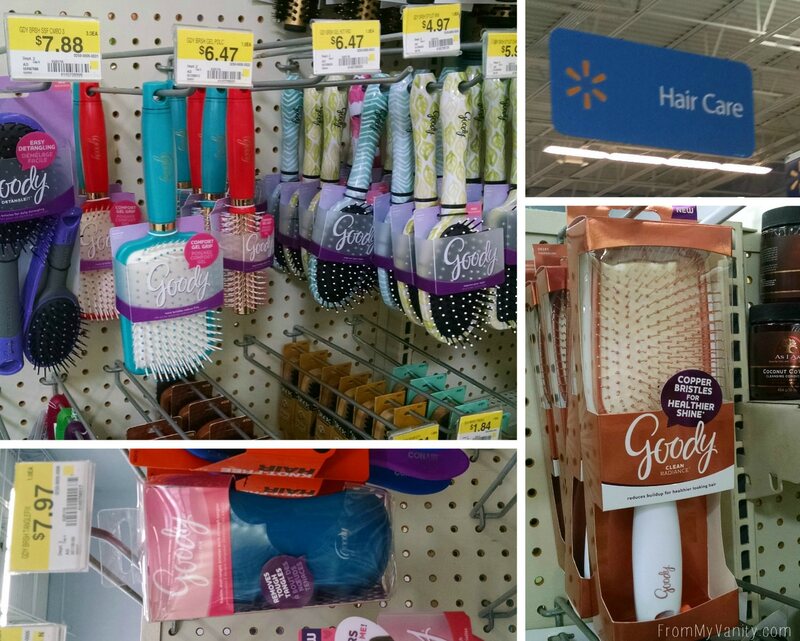 You can find any of these brushes that I use in today’s tutorial at your local Walmart in the Hair Care section. They’re good quality brushes and are very nostalgic for me. They’re the brand my mom always bought for me growing up. 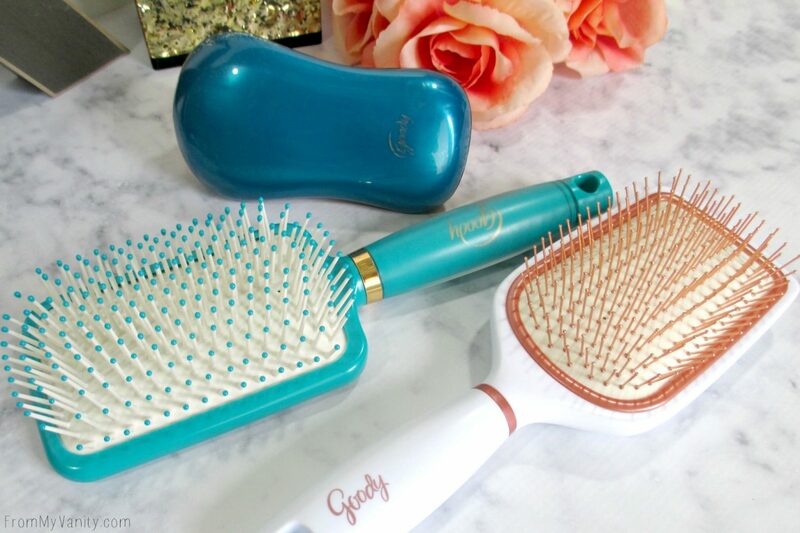 🙂 Goody has a brush for every type of hair — they even have one called Ouchless for brushing young girl’s hair so that it won’t pull at their knots. No more tears! I definitely will be purchasing that brush when Olivia get’s older! The two brushes I will use for this first hairstyle tutorial is the Goody TangleFix brush and the Goody Gelous Grip Paddle Brush. These brushes focus on getting the tangles out without damaging your hair — which is so important to keep the frizz away! I don’t know about you, but my hair is always crazy frizzy after I shower and I got so tired of having to dry it and straighten it. So I’ve got a neat trick to share that will save time and that I use all the time! Step 2 // Using the Goody TangleFix brush, start from the bottom and brush out any tangles. Working from the bottom up will keep your hair from stretching and breaking. Take your time working out any knots, but with this brush it really is almost effortless to fix those annoying tangles! 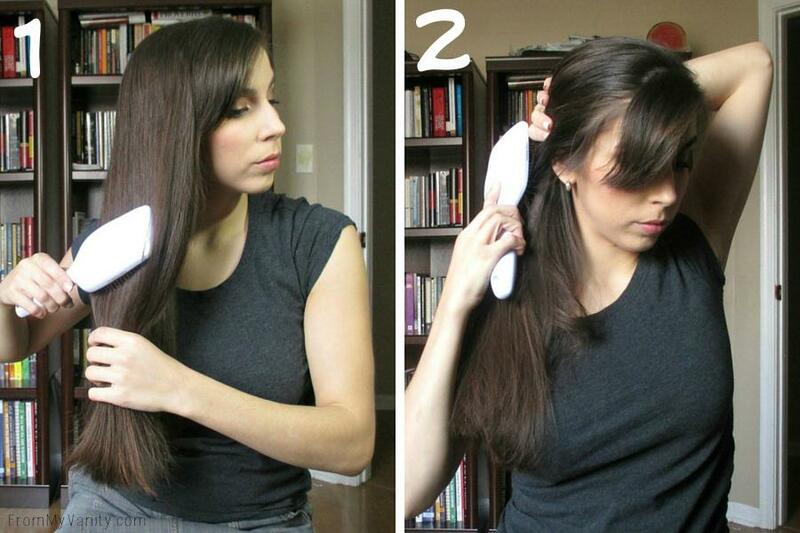 Step 3 // Using the Goody Gelous Grip Paddle brush, use it to dry your hair in a downward motion. This is where the magic happens. 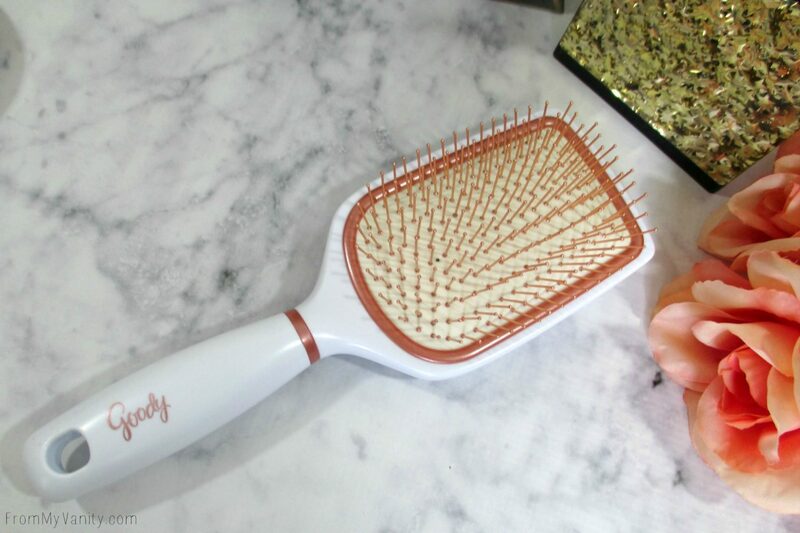 Using a paddle brush as you dry your hair helps reduce frizz and straighten your hair at the same time! 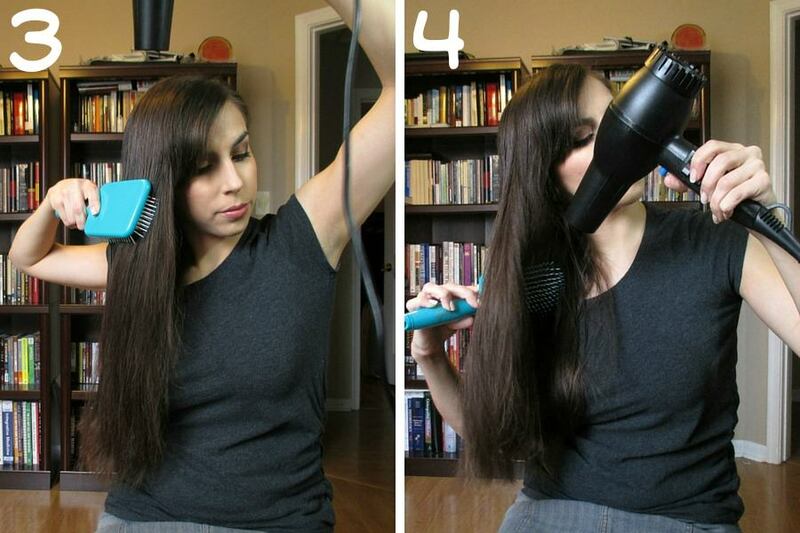 Step 4 // For the hair at the back of my neck, I still use the brush to help straighten my hair as it’s drying. If you’re careful not to blow your hair everywhere, I can totally skip using a flat iron. And! 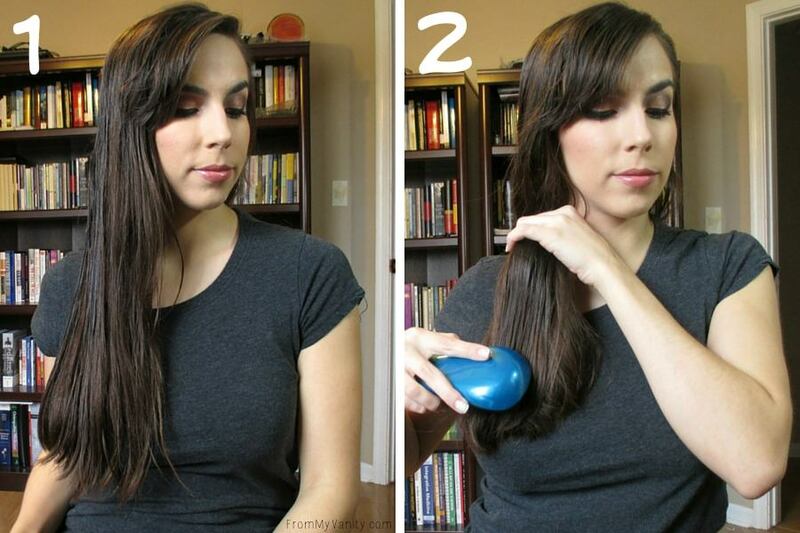 If you don’t like the flat, non-volume look that the flat iron gives you, you’ll really appreciate this trick as it keeps the volume and fullness in your hair. Step 5 // Now that your hair is dry, take a small section right in front of your ears. Since I have bangs, I leave those out, but if you don’t just sweep all the hair up. Step 6 // Instead of a comb, I used the Goody TangleFix again to brush my hair upwards and smooth out any bumps. This brush worked amazing at this job — just as good, if not better, than a comb! 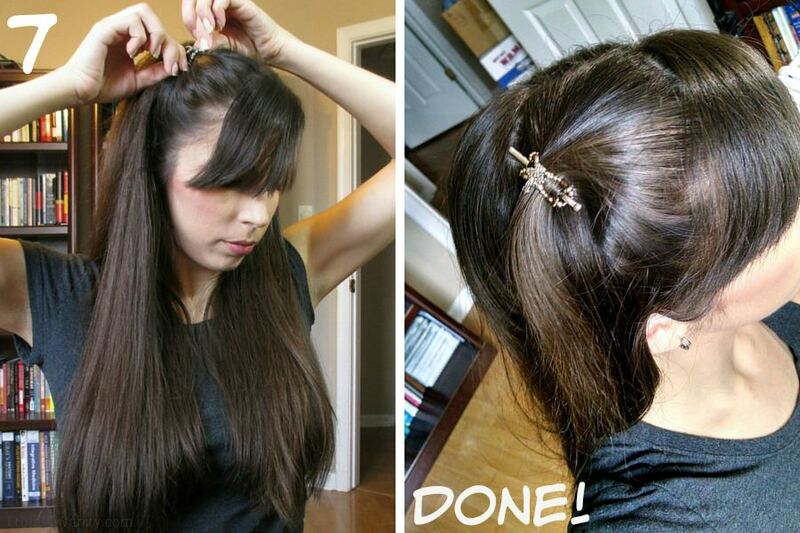 Step 7 // Using whatever hairclip you want — I use a Lilla Rose hair clip — Secure your hair in place. Okay, next hairstyle is a spin on the typical boring ponytail. For this tutorial you don’t have to start with freshly washed hair — in fact, this is often the hairstyle I default to when I am past-due for a washing! 😛 I am only needing one hair tool — the Goody Clean Radiance Paddle Brush. Have you seen this brush at your local Walmart yet? It is so neat! Not only does it brush your hair and keep out the tangles, but this brush is made with copper bristles that helps to reduce the natural buildup in the hair causing your hair to look healthier and more radiant (Thus the name). Step 2 // Brush all your hair to whichever side you prefer (I brought it to my right side). Make sure any bumps or frizzy pieces are tamed. This is going to be a low ponytail, so bring it all to just below your ear. 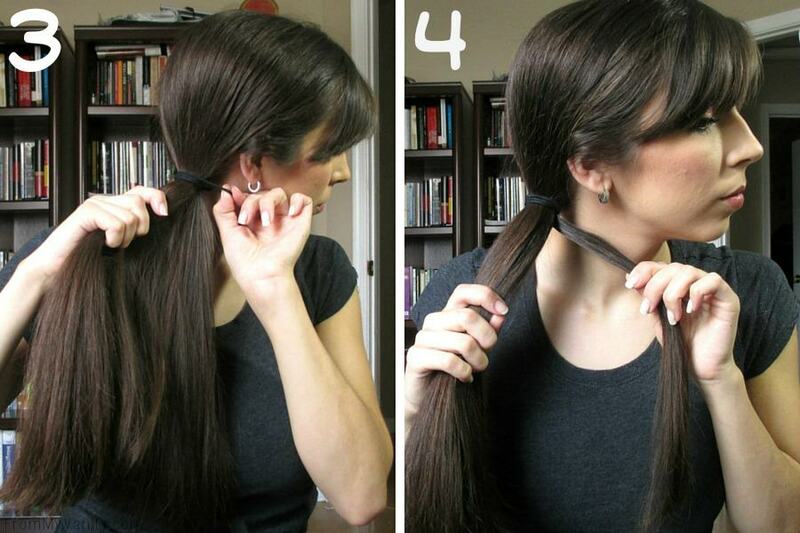 Step 3 // Tie your hair with an elastic hairband. Because your keeping this ponytail low and close to your ear, it’ll allow you to capture all those baby hairs and whispies that always want to do their own thing (another reason I love this hairstyle!). Step 4 // Separate a small section from the back of the ponytail. Step 5 // Braid this section, all the way to the bottom. Secure it with a small elastic band for the time being. Step 6 // Using that small braid, wrap it around the hair tie to conceal it. 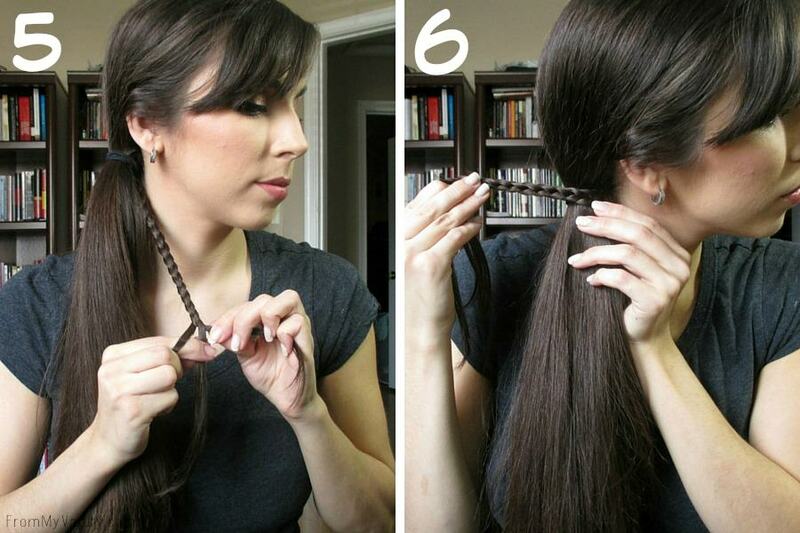 Depending on how long your hair is, you can wrap it once or twice. I was able to wrap it around twice. Make sure it’s very tight so it doesn’t start to slip down throughout the day. Step 7 // Using as many hair pins as needed, secure the braid at the back of your neck. Adjust the placement of the braids so that the hairband is completely hidden. Remove the elastic tie at the bottom of the braid and undo whatever braid is left so that the tail blends into your hair. What’s your favorite go-to hairstyle when you’re in a hurry? If you are looking for more easy hairstyles, check out Goody Brushes for more tutorials! This shop has been compensated by Collective Bias, Inc. and its advertiser. Thank you so much for helping to support From My Vanity through subscribing, reading, and clicking! All opinions expressed in this post are 100% mine. As a busy mom of two I can appreciate quick and easy hairdos! Like you, I’d rather spend my ‘free’ time doing my makeup rather than intricate hairstyles. Great, hope you enjoyed your look! These are my go-to! I have always been a fan of their hairbrushes. They are of good quality. Love that side pony! So pretty! I needed new brushes, too! These are cute hairstyles. I love the elegant side ponytail. Goody hair brushes are also my favorite. Aw, thank you, girl! 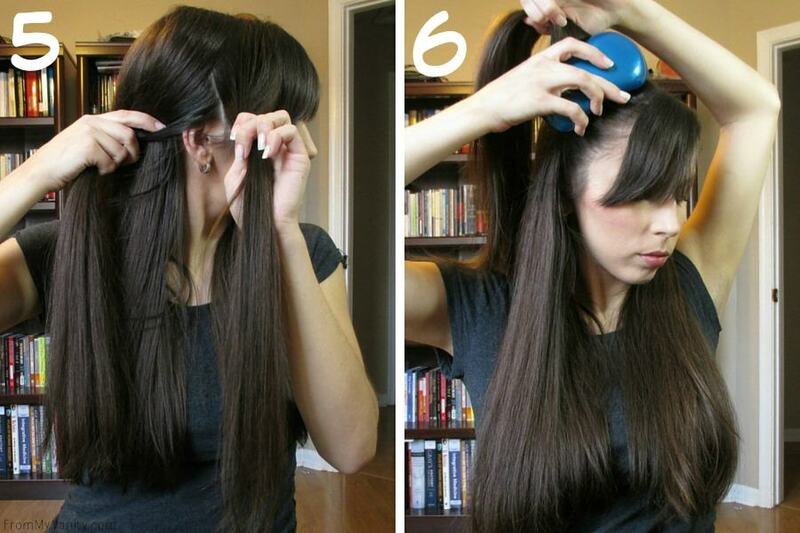 Yes, it isn’t too hard to dress up a ponytail! I love the addition of the little braid to the side ponytail. I think I am going to give it a try on my regular ponytail. It gives it an elegant touch. Ahh, I desperately need some new brushes. Can’t wait for my hair to get back to pony length!! I’ve been thinking of cutting my hair recently, but I’m so indecisive, lol, I never go and get it done 😛 Short hair sounds like a fun change! You’re very welcome — glad you found it helpful! I love these quick and easy hairdos. It’s better to keep it simple so it’s quick and easy. That is a super cute ponytail! I haven’t tried the Tangle Fix brush, but I have heard/read that it works really well. I need to add it to my shopping list! 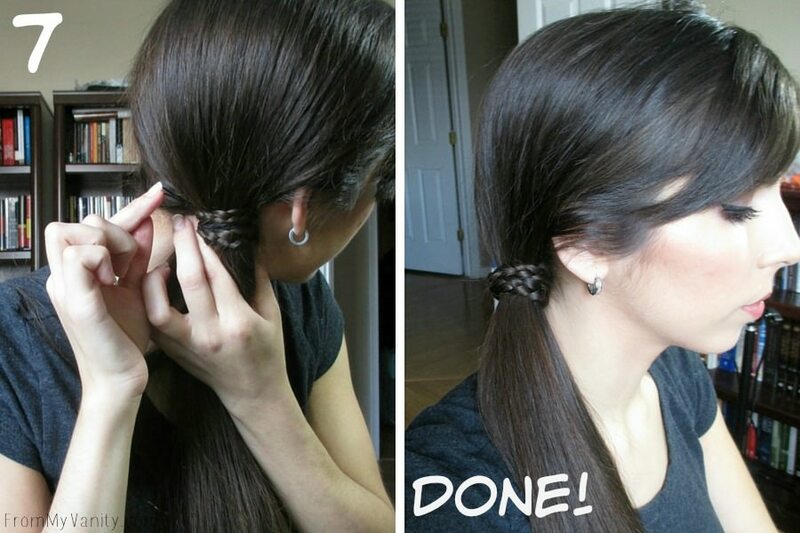 My hair is not as long, but I’m going to try this when I get barrettes. Cute ideas! Love those brushes! Where do you buy them or did I miss it? Love these. Thanks for taking the time to suggest these. Glad you found it helpful, girl! I love the braid wrapped side ponytail! Thank you, I love doing that one, too!